The design for a 50-seat medium-range civil transport began in 1946 with tricycle landing gear, and incorporating four turbojets. The prototype was first flown on 10 August 1949, but only six days later was badly damaged through a landing gear failure. It was repaired and flying again within a few weeks, and its four Derwent 5 engines were replaced by two Derwent 8s (starboard outer, port inner) and two Derwent 9s for evaluation. 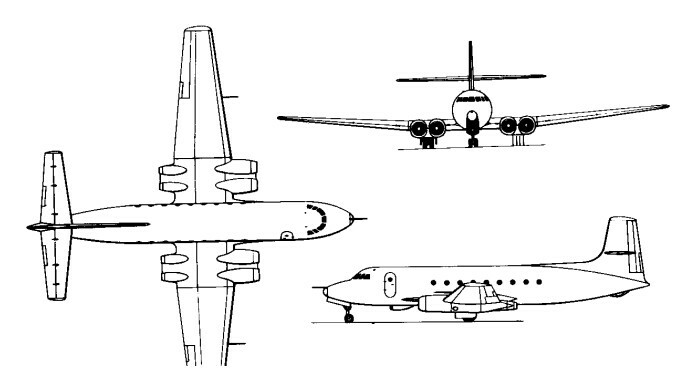 Construction of a second C-102 prototype began, but was not completed. Despite an aggressive marketing campaign directed at U.S. airlines and the USAF, the sales prospects of the Jetliner floundered after the launch customer, Trans-Canada Airlines, reneged on a letter of intent in 1948. The company was still attempting to get the CF-100 into production at the time and, consequently, the Canadian government cancelled any further work on the C102 due to Korean War priorities: C. D. Howe demanded the project be stopped to increase production of the CF-100, so the second C102 prototype was scrapped in the plant in 1951, with the first relegated to photographic duties in the Flight Test Department. After a lengthy career as a camera platform and company "hack," CF-EJD-X was flown for the last time on 23 November 1956 and broken up in 1956, having flown about 425 hours. The nose section now resides in the Canada Aviation Museum in Ottawa.